As one group prepared to protest for amnesty, another group went to work on a fence outside of San Diego over the weekend. About 200 volunteers organized by the Minuteman Civil Defense Corps of California began building a 6-foot barbed wire fence Saturday along a quarter-mile stretch of rugged terrain in Boulevard, which is located 50 miles east of San Diego. 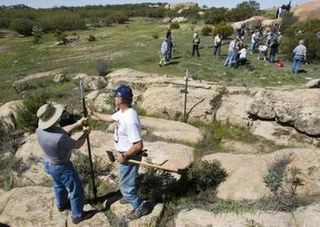 Tim Donnelly, the group’s leader, said volunteers ate apple pie and hot dogs as they worked on the fence, which was connected to an existing 12-foot high fence previously built by the federal government. 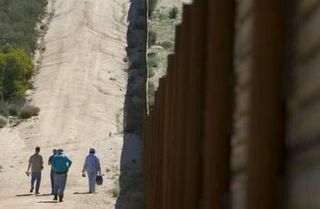 The volunteers wanted to send a message to Congress that the government should block entry to the United States and not grant amnesty to illegal immigrants, Donnelly said. Another day doing the job that Congress refuses to do. Minutemen leader Chris Simcox said there are already about a half dozen landowners who will allow the fencing.